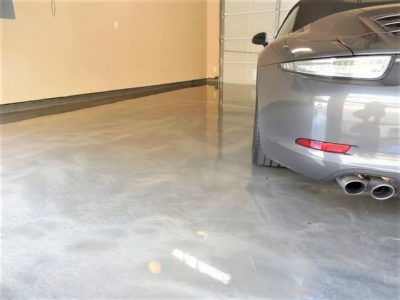 The easiest and most cost-effective way to upgrade or restore an old concrete garage flooring is by resurfacing it with a new coating. If you want something quick and can be installed regardless of the season or climate, Polyurea Polyaspartic is the coating you should check out. Polyurea polyaspartic is a coating originally developed to protect concrete floors in industrial facilities. It is water-soluble, making it easier to install than epoxy. It penetrates the concrete slab effectively, thus, creating a stronger surface that won’t crack or peel. Unlike epoxy, polyaspartic is resistant to UV rays. It can be applied on both indoor and outdoor concrete surfaces. Another major difference is the amount of time needed to install the coating. While epoxy requires a few days to dry and cure completely, polyaspartic cures just a few hours after application and is ready for use the next day. One trait that draws homeowners to choosing polyurea polyaspartic for their garage flooring is its versatility when it comes to installation. It is such a stable material that it can be installed all year-round. Whether it is winter or summer, the coating stays in good shape and the installation process is not affected at all. It can be applied in temperatures between -35°C/-31°F and 60°C/140°F. If you have not winterized your garage flooring and the winter season has begun its course, polyurea polyaspartic is an ideal solution. A concrete garage floor could face serious damage when exposed to snow, ice, and the deicers used on public streets. A polyurea polyaspartic coating is seamless and non-absorbent. It keeps the concrete garage floor safe against melted snow or ice. You don’t have to wait for better weather to install it. It can be installed during winter in case you forgot to winterize the floor or if you suddenly find the need to add an extra layer of protection to the surface of the garage floor. Just when you thought there is not one material out there that could provide you with a quick, reliable fix, along comes polyurea polyaspartic. The coating may have been designed for industrial use but its ideal features and benefits easily captivated the attention of both residential and commercial concrete owners. Now, you can acquire tough, durable, and damage-resistant garage floors in as little as a day.